With a $2,350 grant from CEO’s Seeds for Success, Literacy Volunteers of Rensselaer County is serving adult basic literacy learners in a new weekly tutoring program, the Literacy Study Circle. 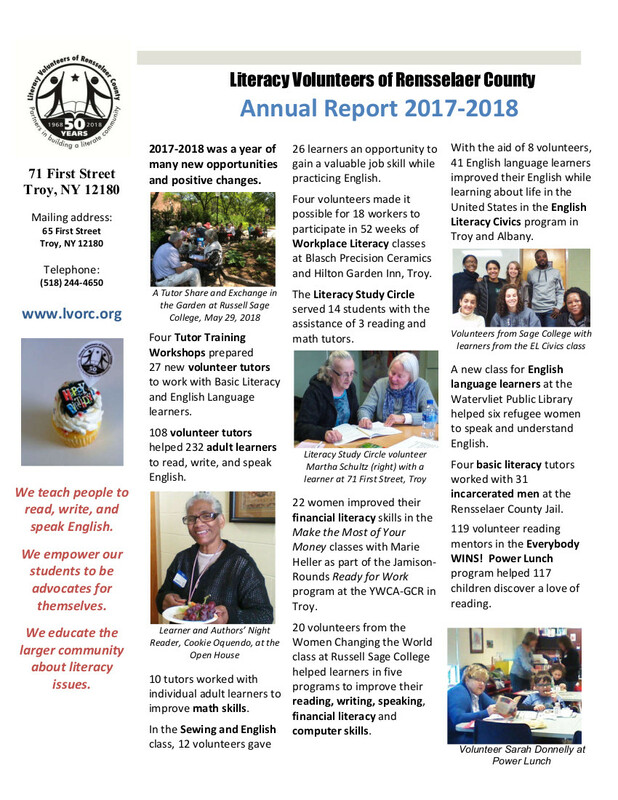 While LVORC aims to pair adult learners with individual volunteer tutors for help in reading, writing, math and computer literacy, the number of learners consistently surpasses the number of available volunteers. Currently there are 25 adults waiting to be matched with a tutor for reading and writing and another 27 waiting for a math tutor. The waiting list grows by the day. Many times we find that students get discouraged while waiting and lose the motivation that brought them to LVORC in the first place. We want to be able to capture this interest and provide support much sooner, and the Literacy Study Circle fills this need. The Literacy Study Circle allows learners to start working on reading, writing and/or math skills in a safe and confidential learning environment while they wait for their own one-on-one tutor. With funding from CEO’s Seeds for Success, LVORC provides trained tutors who work on literacy skill development once a week in a group that can accommodate up to 20 adults. The funding also provides materials for students and tutors, as well as learning resources and support from LVORC staff.